Leading scallop and surf clam producer, Atlantic Cape Fisheries (ACF) recently installed an IQF Tunnel freezer as well as a slurry ice and delivery system from Skaginn 3X. The IQF Tunnel Freezer installed at ACF‘s facility in Fall River has the capacity of freezing up to 9000 pounds per hour and is the largest freezer Skaginn 3X has set up in for the scallop industry in the US. The installation is a part of a large expansion which will be completed by the end of the year. “We were happy to accept the challenge when ACF approached us with this request. Our main concern with this project was lack of space. 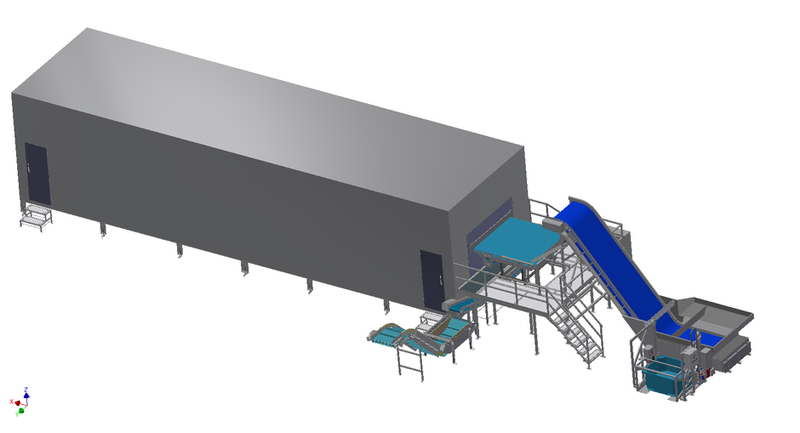 Thanks to the IQF Tunnel Freezers design, the freezer can be located outside the plant with the infeed/outfeed facing into the production area. This saves a lot of valuable space. This is the 6th freezer we have setup here in the US. This installation took 3 weeks and is by far the largest to date.” Says Sigurður Skúlason, Skaginn 3X.